Have you visited Polka Tot Boutique online? I recently was introduced to them and love their products! Being a mom of 3 boys I always find it hard to find cute personalized boutique items for boys, I am glad I have a one stop shop now! Polka Tot Boutique designs fun and unique items for babies, kids, teens, moms, teachers...everyone! I am a WAHM of a two children and I would love to create a special keepsake for your child! If you don't see an item that fits your child's personality please submit a custom order and we will create one. 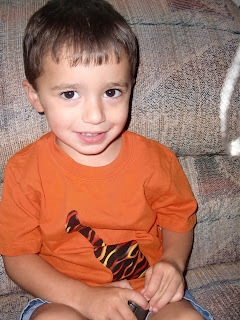 Recently my son was sent a "cool" shirt as he calls it from Polka Tot Boutique. The first thing I noticed was the great quality of work and look of the shirt. 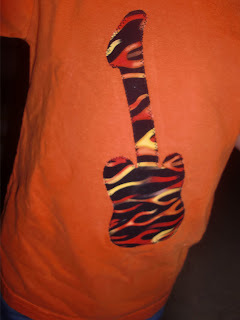 We received a orange t-shirt with a flame guitar. It has been washed many times in the little time since we received it (my son is messy) and it has washed up fantastic. Here are some photos of him showing off his shirt ! With my little ones birthday in about 4 months, this cute birthday shirt with the number 3 caught my eye, I plan on getting one for him to wear at his party ! A Shirt From Polka Tot Boutique !!! Winner has been emailed, please reply within 48 hours or a new winner will be chosen. The Hot Pink and Black Initial Shirt for little girls is just adorable! What a great shop...so many cute things! I cannot get past the cute cute candy corn shirt! I think that's what I would pick. I also really like the welcome baby plaques. I love the Red & Black Initial Shirt. Emma would look adorable in it! I have the Life In A House Of Blue Button on my sidebar! I love the Headband Hook! What a cute idea! We could use one! I love the Red Mommy Apron too! I like the bathroom plaque, "Splish Splash let's take a bath". Cute! I love the Purple and Black Polka Dots Initial Shirt! I love the Paisley & Patchwork Wall letters! Oh ~ the Hunting Theme Wall Letters are such a wonderful idea! i also love the boys 4th of july-memorial day shirt! I love the Butterflies & Flowers Initial Shirt! My daughter would love that! I like the butterfly keepsake box. Very cute!! This website has great stuff! I love the Mommy and Daughter Cherry Pie Apron set! I like the Play room plaques! I like the Baby Blue Dino Gift Set. My niece is turning 1 in a few months. I love the Pink and Brown Polka Dot birthday shirt! And I love that unlike a lot of birthday shirts, she could totally wear it again. What a great giveaway! White with Pink & Brown Dots!!! I like the hot pink and black initial shirt. Thanks! I like the printed ribbon bailey bow! I love the cherry pie apron! I love the Football Theme Cap Holder! I like the Bright Green & Pink Kalli Bow. I love the butterfly keepsake box. Too cute! I like the wall letters for decorations. I also like the Easter polka dot shirt and all of the hairbows!! Thank you! I like the girl wall letters. I think the Cherry Pie Apron is very cute! I love the Tropical Summer Birthday shirt, so cute!
! But yeah, thanks for spending time to talk about this topic here on your site. some general things, The web site style is great, the articles is really excellent : D.
I do not know whether it's just me or if perhaps everyone else encountering issues with your website. It seems like some of the written text on your posts are running off the screen. Can someone else please provide feedback and let me know if this is happening to them as well? This could be a problem with my browser because I've had this happen before. I'm completely confused .. Any suggestions? Thanks a lot!